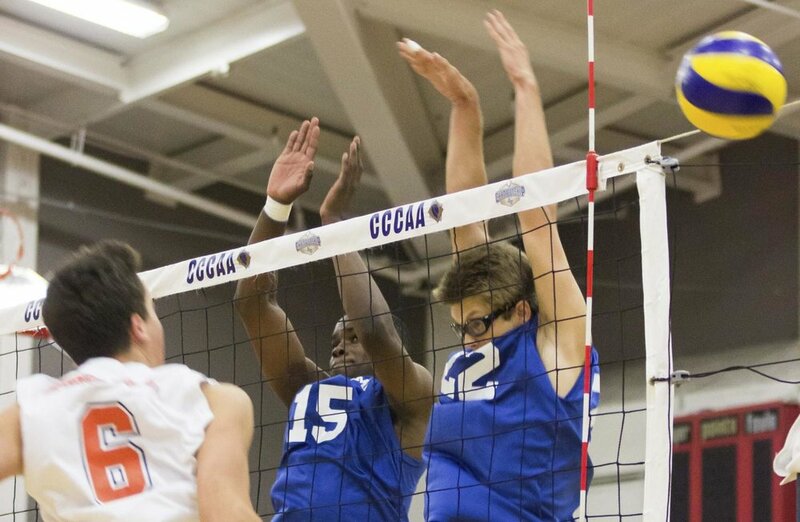 Santa Monica College Corsairs mens volleyball Middle Hitter, Vecas Lewin (15) spikes the ball against Orange Coast College Setter, Colby Edler durring the Califonia Community College Athletics Association playoff game against the Orange Coast College Pirates at Pierce College in Woodland Hills, California, on April 27, 2017. Marisa Vasquez. 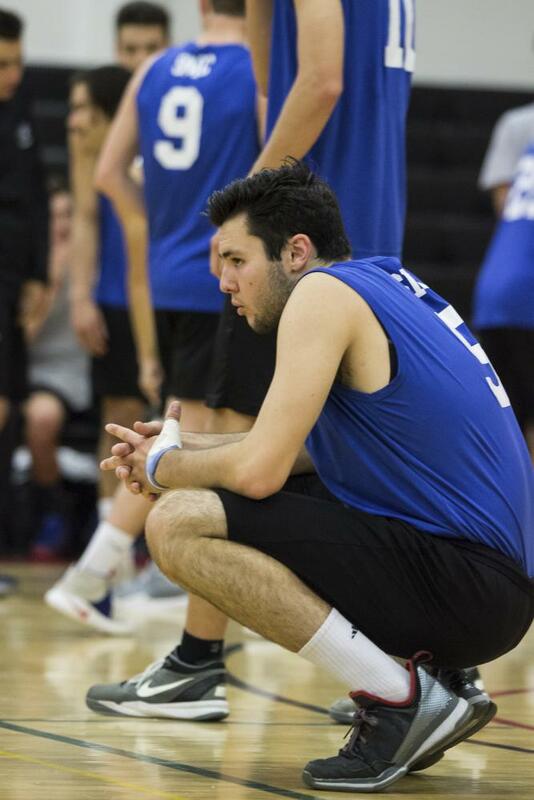 Santa Monica College Corsairs mens volleyball Middle Hitter, Andrew Dalmada (5), takes a second to mentally prepare himself moments before the start of the Califonia Community College Athletics Association playoff game against the Orange Coast College Pirates at Pierce College in Woodland Hills, California. on April 27, 2017. Marisa Vasquez. Santa Monica College Corsairs mens volleyball Middle Hitter, Bradley McCallister (9), celebrates a point made by the Corsairs during the Califonia Community College Athletics Association playoff game against the Orange Coast College Pirates at Pierce College in Woodland Hills, California. April 27, 2017. Marisa Vasquez. Santa Monica College Corsairs mens volleyball Right side hitter, Shane Stoklos (10), and Middle Hitter, Andrew Dalmada (5) attempt to block an incoming ball durring the Califonia Community College Athletics Association playoff game against the Orange Coast College Pirates at Pierce College in Woodland Hills, California. April 27, 2017. Marisa Vasquez. Santa Monica College Corsairs mens volleyball Middle Hitter, Vecas Lewin (15) and Oppositie Hitter, Stanton Smith (22), block an incoming ball durring the Califonia Community College Athletics Association playoff game against the Orange Coast College Pirates at Pierce College in Woodland Hills, California. April 27, 2017. Marisa Vasquez. Pierce College’s South Gym blasts with music and the sound of pounding warmup spikes as Orange Coast College and Santa Monica College prepare their teams for one of the most crucial games of the season: The California Community College Athletic Association’s Men’s Volleyball Semifinal Game. During their first match in February, the Orange Coast College Pirates had lost to the Santa Monica College Corsairs 3-1 making that the only loss of the season thus far. It was time for these two rivals to face each other one last time. Once the game commenced, both teams were ready to prove they deserved a spot in the final championship game, but one team had to fall short in the semi-finals. The OCC Pirates started the set off with a server error, handing the SMC Corsairs their first point of the match. Two kills by the Pirates and two attack errors by the Corsairs gave the Pirates a momentous lead that the corsairs fought tirelessly to keep up. The match continued with two consecutive kills by Dane Pieper and Andrew Dalmada from the Corsairs which evened the scoreboard. There were a couple lead changes in the end, but the Pirates stood their ground and forced a 22-25 win. Using the tail wind from the first set, OCC continued the barrage with a 19-9 run. Multiple bad serves, blocks, and passes lead the Corsairs into a deeper hole. Unable to swing back, the Corsairs ended the second set only scoring 14. The onslaught continued into the third set as the Pirates go on a 2-8 run. The Corsairs then put in their best effort to try and upset the pirates. Dalmada and Peiper put the team on their backs and forced multiple lead changes towards the end of the match. The set was neck and neck. At 25-24, the Corsairs fought off two match opportunities but in the end, could not hold off two clutch kills by the Pirates’ Jordan Hoppe and Justin Kam. The OCC Pirates on April 29, set their sights on their 20 straight winning streak against the 7th seed El Camino Warriors for the state title and would be victorious winning all three sets.